Established in 2012, Sri Balaji Enterprises, Chennai, is well known organization that is engaged in manufacturing, supplying, and exporting of various Ventilators and Roofing Accessories. The offered product range is widely demanded in the market for their distinctive attributes such as high performance, minimum power consumption, low cost of maintenance, and easy installation. Offered product range is manufactured using latest technology and sophisticated machinery, to ensure industry laid standards of quality. Backed with highly experienced team of professionals, our company is committed to meet the diversified requirements of our customers. Our professionals work in close proximity with each other, to offer our customers unmatched quality products. To ensure delivery of flawless products, the offered product range undergoes various in-house testing by our quality controllers. We have delivered these products in fixed time constraint, with the sincere efforts of our logistic professionals. We are currently operating under the leadership of our manager Mr. Mahesh. He is backed in this industry with vast experience and knowledge of this domain. Owing to his guidance and customer centric approach, we have gained rich client base across the globe. 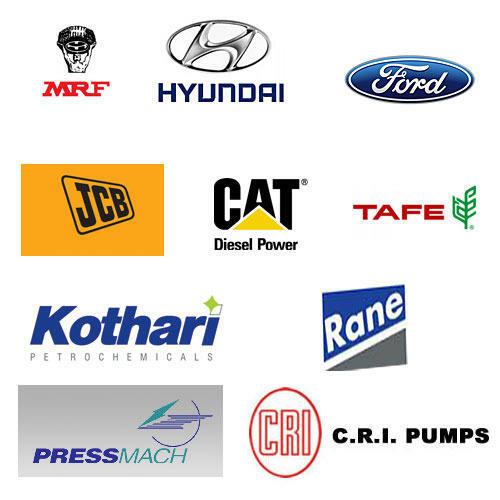 Some of our reputed customers are MRF, Hyundai, Ford, JCB, and CAT Diesel Power. We export our products all over the Indian Subcontinent. Backed with high professional experience in this domain, we engaged in manufacturing, exporting & supplying following products. We believe in offering our customers with finest quality product range to our customers. To ensure this, the various quality assurance procedures starts from procuring of raw materials to final dispatched of our product range. The offered products undergo rigorous quality testing on various parameters, to ensure delivery of flawless product range at customers’ end. Our organization has incorporated in the year 2011 with sophisticated infrastructural facility that spreads across vast area land. To ensure our operations to be strictly stream-line, we have divided our infrastructure into various units. Latest technology and modern machinery are used in manufacturing of our product range, to ensure high standards of quality products delivered at customers’ end. We are supported by dedicated team of professional who work 24x7 to fulfill the ever-changing requirements of our customers. Our engineers and technician manufactured these products as per the industry laid standards. To ensure delivery of defect free product, these products are fully tested by our quality controllers. The logistic professionals working with us, ensure timely delivery of our product range at customers’ end. Owing to our ethical business practices and client-centric policies, we have been able to win the trust & appreciation of our esteemed clients. We strive hard to achieve maximum client satisfaction by offering them customization solutions in tandem with their requirements. Moreover, we strategics all our business activities, which enable us to maintain cordial relation with our clients. Owing to optimum quality product range delivered effectively at our customers’ end, we have able to develop huge clientele across the world.